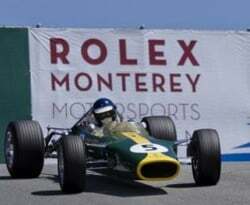 Racing fans are ready in Monterey, California for the Rolex Monterey Motorsports Reunion set to begin today. The event will see pre-and post-war race cars compete at the Mazda Raceway Laguna Seca today and a host of other events throughout the weekend along the Monterey Peninsula. The exciting Rolex sponsored event will see some of the most historic cars race for glory, along with one of the biggest and most prestigious car auctions held in the world. The auction will feature a host of amazingly rare cars including the 1935 Duesenberg Model JN Convertible Coupe, 1957 Ferrari 250 GT LWB California Spider Prototype, 1931 Bentley 4 ½ Litre SC “Blower” Sports 2/3 Seater Boattail, 1932 Bugatti Type 55 Cabriolet, and 1932 Daimler 40/50 Double Six Sports Saloon. The Rolex Monterey Motorsports is an event you do not want to miss out on. Not to mention, the reunion will celebrate the 50th anniversary of Carroll Shelby’s Cobra and see the Rolex Daytona steal the show where watches are highlighted. Racing lovers have long been enamored with the Rolex Daytona since the 1970s, especially with the versions worn by Paul Newman throughout his professional racing career. Because of the rare nature of the pre-owned Daytona Rolex, its value holds amazingly well in today’s used Rolex marketplace. Another Daytona that will be turning heads is that of the first Cobra Daytona Coupe ever built. Event visitors will be able to get up close and personal with the Cobra Daytona, which was the only one of its kind built in the USA. The Rolex Company has signed on as a sponsor to the event because of the community’s commitment to keeping the vintage car market full of life. Rolex’s rich history runs parallel with some of the most valuable cars in history, as their drivers have been known to sport the Rolex Daytona, Rolex DateJust, Rolex President, Rolex Explorer and other adventurous models. Plus, today’s Vintage Rolex market is bursting at the seams, with some models selling for hundreds-of-thousands of dollars. Stay tuned for more news from the Rolex Monterey Motorsports Reunion and other Rolex sponsored events!